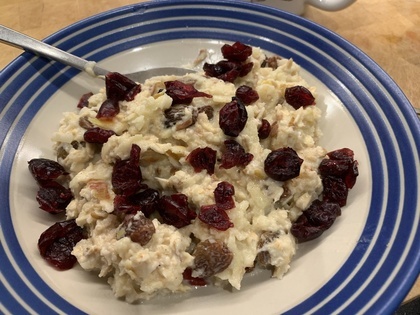 I've had bircher muesli a few times from different places and enjoyed it, so I thought I'd have a go at making it. There are many variations of the recipe especially around ratio of oats to apple, and whether you should use apple juice, milk, water or yoghurt. I thought this combination works pretty well. Put the oats, cinnamon, sultanas, apple juice and milk into a container that can be sealed. Grate the apples in, and thoroughly stir the mix. Put in fridge overnight. Serve and top with a few dried cranberries (or anything else you fancy). It should keep for up to 4 or 5 days in the fridge in a suitable container.